Christmas Trading: All orders received after 5pm on the 26th December (Australian time) will be processed when we return in the first week of January 2019. Please note deliveries sent via Courier do not deliver to a PO BOX. KL Swimwear is not responsible for any lost or stolen parcels once it has been dispatched from our warehouse and in transit with the postal carrier. All parcels sent via Australia Post are insured. You must contact their customer support and report your parcel missing. Please Note: Some countries are more expensive to ship to, shipping charge may be adjusted at check out for these countries. Or we may send via an alternative shipping method and sipping may take longer to certain countries. FREE INTERNATIONAL SHIPPING on orders over $300 ( You must add the free ship coupon at check out for this to apply to your order and will only work on orders over $300. The free shipping coupon will not work with other coupons have been used within the same order. If your package hasn’t arrived please check your mail box for a slip to pick your item up from the nearest Post Office. You can track your item through AUSTRALIA POST for Local Deliveries or DHL for all international deliveries. You will receive a tracking number direct via email from either Australia Post or DHL when your parcel is sent. If you are not home to sign for your delivery Australia Post will leave a collection slip in your mailbox for you to pick up at your local post office. For information on DHL missed deliveries click here. Kristen Lonie Swimwear is not responsible for the theft or damage of a parcel/article once it has been dispatched. The customer accepts full responsibly for any loss or damage to these items. The customer is responsible if their package gets redirected to Kristen Lonie Swimwear marked as unclaimed and does not offer free shipping back to the customer. When placing an order, it is the purchaser’s responsibility to ensure that all details conveyed in the order are correct & true. Kristen Lonie Swimwear does not accept liability for products sent with errors made by the ordering party. Kristen Lonie Swimwear does not offer free return shipping should your parcel need to be resent. Import duty and taxes may be payable on your order depending on the trade agreements your country has or has not with Australia. Please familiarise yourself with your countries regulations as payment of these duties may be necessary to release your order. 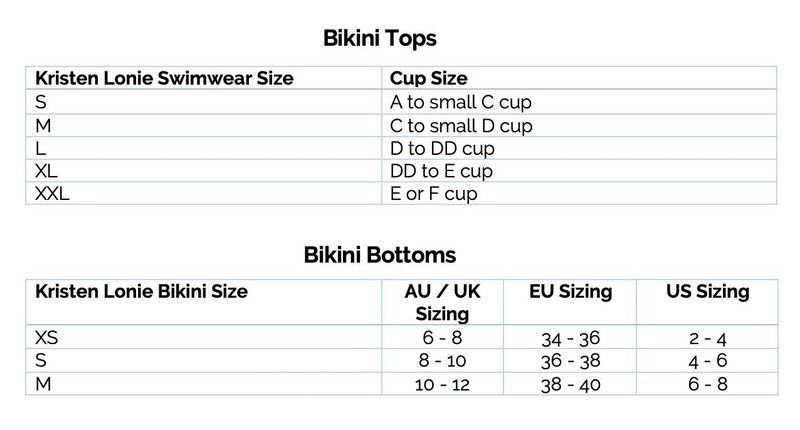 Kristen Lonie Swimwear is not responsible for any import charges, duties, or taxes for international sales. In some cases, packages can be delayed due to matters outside of our control. You can pay via Multiple payment methods.